Another appointment of the weekend is from Friday night at the Pensioner’s Home. The latest trends in flamenco fashion and children’s clothing will be displayed in his patio in an initiative promoted by the parish group of the Virgen de la Soledad. Thus, the summer parade organized by the parish collective and the shops of the “Mar Pantoja-Chiquita”, “Arte y Salero” and “Tio Gilito” sector return. Throughout the weekend they will show their novelties in flamenco dresses and children’s fashion. Today Friday, July 13, starting at 9:00 pm, “Chiquita” will do it. 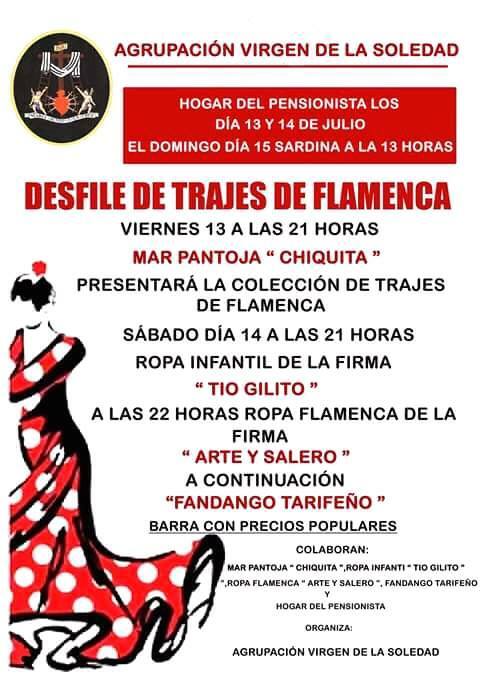 On Saturday, the 14th, from the same hour it will be the moment of “Tío Gilito” with children’s fashion, and “Arte y Salero”, around ten o’clock at night, with flamenco costume shows. The live performance of the group of Fandango Tarifeño “Our Lady of the Light” is also expected. FRIDAY1 3 AND SATURDAY 14TH OF JULY announces a “sardine” end of party from 1:00 p.m. All this in the courtyard of the Pensioner’s Home, and with the collaboration of the board of directors and Social Affairs area.